1. Bikes bikes everywhere! 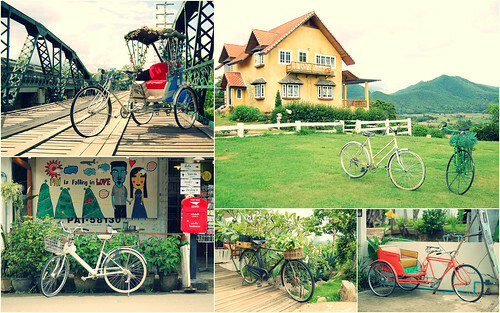 Vintage bikes, decorated rickshaws, even planter box bikes! 2. You overwhelm me with your Pai smiles. I see it on your walls, your people and even your banks! 3. 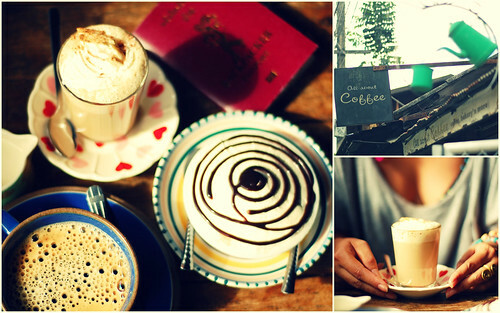 You got me hooked on your delicious cappucinos, bannoffee pies and artsy cafes! 4. You are a paradise of art! You corners are filled with pretty little corners just waiting to be discovered. I also adore your beautiful souvenirs like postcards and custom t-shirts. 6. 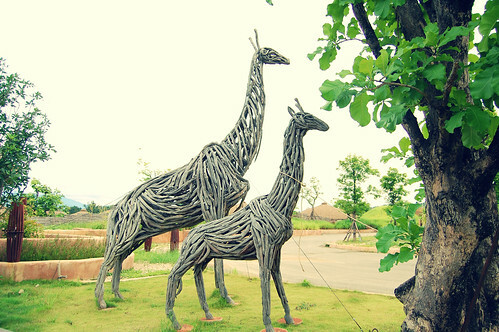 Pai is a truly romantic town. Love is all around! 7. 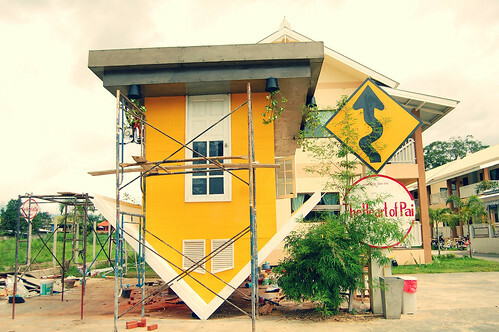 Where else could you find an upside down house? 8. Pretty, colorful street art! An entire town just came together to create a place that would make you smile. 9. For a touristy town, it's impressively clean. There's absolutely no trash in sight. And the air is fresh! How's that for a community effort? 10. 3 words: Manual ferris wheel! Wheeeee! 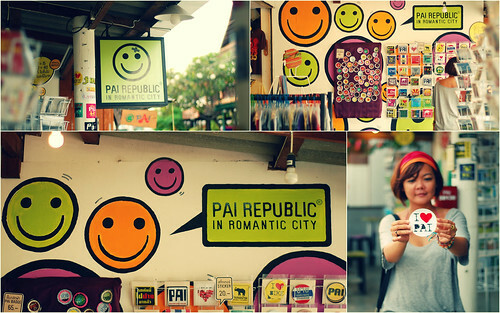 Did you fall in love with Pai just like us? Who wouldn't? If you get to Northern Thailand, make sure you drop by this place. When people ask me what I think about Pai, I always answer: Pai is love. 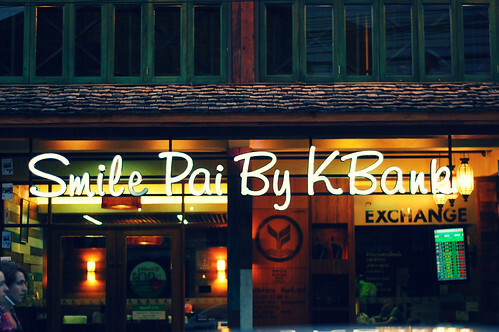 Pai is only 134 km from the city of Chiang Mai, Thailand. But the ride takes 3-4 hours because of a steep, winding road. It was so winding that 5 out of 8 people in our van threw up. The only ones who were spared were Chichi, myself and the driver. So make sure you take your car sickness pills and a barf bag! 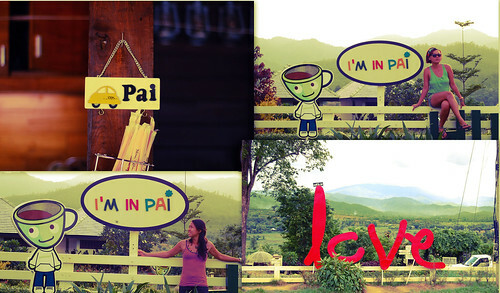 Forever in love with Pai. If you liked this post - Like it, Tweet it, Stumble Upon it and let the world know by clicking the share buttons below. We'll love you for it! Looks like a great place to visit. Will definitely check it out when we get to Thailand in a few months. Thanks for dropping by Aileen. You should see Pai for yourself. It's even better than the photos. Yes, don't miss it Lavanya. The first 2 times I was in Thailand, I missed it. So had to make a third visit. I'm sure there'll be a fourth, and a fifth.. This post made good timing then. Share your own Pai story with us pls. And if you guys like music, check out Edible Jazz. Nag reminisce ka Grace? Beautiful di ba? Sana nga may ganito sa Pinas. Gawa tayo! I knew you would fall for this place too since ikaw ang nangunguna sa mga ka-cute-an! Wow!!! I plan to explore Northern Thailand (Ayuthaya, Chiang Mai) next year... and thank God I saw this blog... will definitely visit Pai .... Lovely!!! Yay! Another convert! 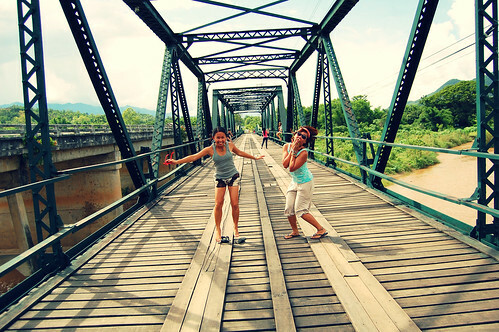 Don't pass up on your chance to visit the most photogenic town in Southeast Asia. 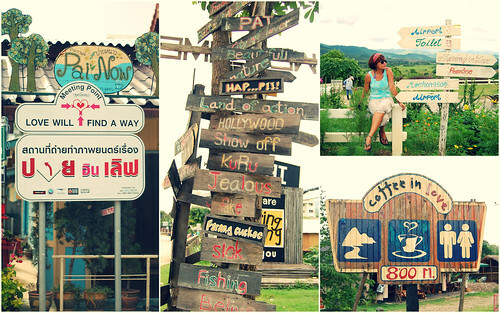 Pai Maehongson is my fave place in Thailand aside BKK. I was there last Christmas till New Year. It is a trendy city up on a hill, with a cool weather at night like Baguio. Your blog reminds me of my travel there...I had drawn to that place easily. Make me want to go to this place because it looks so artsy and cute. Yes Gwenzy, Pai deserves that 2nd round. Careful, you might never want to leave this place! Thanks ayan, that's because this place is truly inspiring! So glad you also experienced Mae Hong Son Eric! It's just the perfect place to relax and take a lot of photos. Merong sumasakay jan! Kami! Chichi and I had fun taking turns pushing each other. We felt like 3 year olds again! Thanks Rob, you will really fall in love with this place as a photographer and an artist. You may even make it your home! I didn't know about this place until now. And I could have gone too since I stayed several days in Chiang Mai. It looks like a really beautiful place to relax and have fun in. Plus, it would be cool to see that upside down house. Yes Steve, all you need is a motorbike, a map and you're all set. Don't forget the travel buddy! Thanks Audrey! This place brings out my artsy side. You perfectly pictured Pai, very inspiring, wow! It's one of my favorite places in northern Thailand too. Wow I like this place na. Thanks for the photos. Will try to conquer Thailand naman next. Ok kaya sya on December? or maulan? Thanks Corrine! So glad you enjoyed this pretty place to! Thanks for stopping by Carmen. 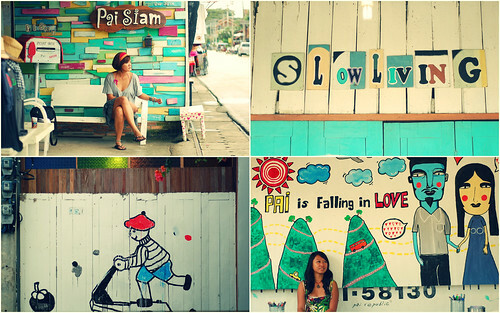 You have to go to lovely Pai on your next trip to Thailand. No itinerary really. It's a small town and just a few hours from Chiang Mai. Just go to the main town where the hostels are. Rent a motorbike and grab a map and you can go around on your own. Don't miss Coffee in Love coffeehouse, Pai Canyon, Hot Springs, WWII bridge, Chinese village and all the prettiness around! ohhh Pai. Thank you for sharing this.. now I know there's this cute town up north. 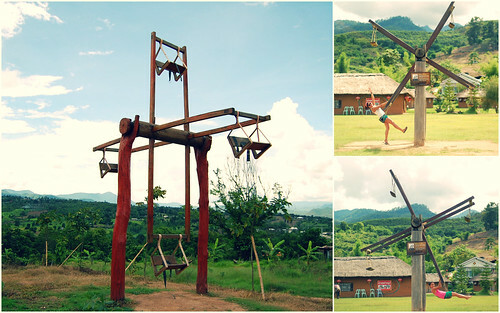 :) I guess this should be one more dream I should achieve, go to Pai!! http://www.bangkokiswaitingforyou.com/wishlist/422... this I saw in Mr. Richard Barrow's blog. i love Pai as well...in fact, Pai is the reason why I started blogging about my travels...and your site was recommended by my friends Ed and Doi...thanks! What kind of public transportation would I take if Id be going from bangkok? And How long would it be? Thank you!! Hi Lois, thanks for this! Are all those photos in just one little town? 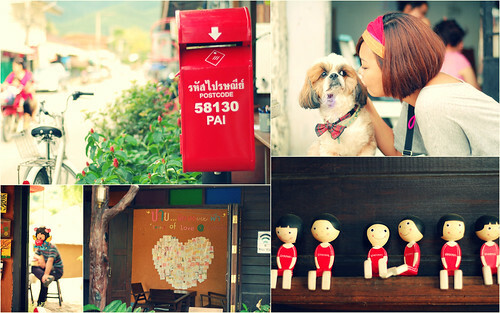 We will be staying in Chiang Mai so we might go there! :)) yihee! Will def check out Pai! Any accommodation recommendations?